If you can say anything about marketers, it’s that we love obituaries. Yes, we love to declare things dead. Outside the rarified air of marketing punditry, however – i.e. in the land of marketing practitioners – all three of these concepts are still alive and well. Why all the premature death notices? A simple explanation is that marketers love the new and different and bright and shiny, and nothing generates views and shares more than telling marketers that everything they’re doing is old-fashioned and outdated and well, deceased. No argument there. B2B marketers have long understood that identifying prospects by role, company type and selling stage, and then targeting content and campaigns to those same segments, is a sure recipe for success. What’s changed? Mainly that technologies – ABM being a prime example – now make it possible to implement that personalized approach with a sophistication, and at a scale, that wasn’t previously possible. Look, I’m all for creating a mix of content – ebooks, video, Webcasts, infographics, ebooks, case studies, etc. – the better to attract a wider spectrum of prospects with different preferences for how they like to consume information. 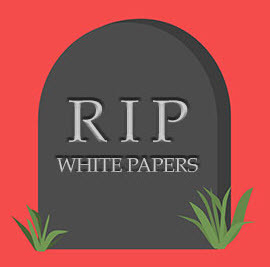 But is the white paper dead? Sorry, I don’t buy it. And neither would all the B2B companies who generate thousands of quality leads every year through content syndication and other white paper marketing channels. I understand that the PDF white paper seems quaint and old-fashioned, and because we marketers live on the bleeding edge of all that is bright and shiny, we might have trouble accepting that prospects would rather download a 5 page ebook vs. say, watch a 5-minute interactive video. Just remember that there’s one principle that trumps everything we think prospects SHOULD want simply because it’s more dynamic and interactive. That principle is convenience. Yes, prospects want information that is targeted and personalized and relevant. But they also want information that is easy to access, easy to consume, and easy to share. And a PDF document, no matter how old-fashioned, is about as convenient as it gets. Now I will grant Dun this point … the old-school, 8-1/2 x 11, text-heavy, academic-style white paper is indeed on its last legs. Most white papers (ebooks, really) are now much more likely to be colorful, image-centric, visually engaging and mobile-friendly. But I would argue that’s not because prospects necessarily demand more engaging, interactive content. It’s because a less text-heavy, ebook-style white paper is easier to read. As a marketer, should you look for ways to make your white paper more engaging? Absolutely. But don’t let the siren call of all that is new and shiny cause you to abandon white papers altogether. Contrary to rumor, white papers still have some life left in them. For a closer look at creative ways to make demand generation content more engaging, download our free ebook: “10 Great Examples of Demand Generation Content“. This entry was posted in B2B Marketing, Content marketing, Content Syndication, Demand Generation, White Paper Marketing, White Paper Syndication, White Papers and tagged Content marketing, content marketing agency, content marketing best practices, content marketing strategy, content marketing tips, Content Syndication, white paper best practices, white paper marketing, White Papers on February 28, 2017 by Howard Sewell. When we break free from the whitepaper constraint, there is so much more we can do! It certainly makes sense to offer a few whitepapers to download on a blog post as you do here (and we have too). But when I click the link on one of these interesting sounding white papers you present me with a form with six questions. If I fill out the form truthfully you will learn that I have Marketo for automation and that I am the SVP of marketing. Those are good things to know, but wouldn’t you also like to learn something interesting about things like my team size, my industry, how I think about leveraging services partners, or whether or not my PPC campaigns are performing well? Useful information to determine how to nurture me, or how best to follow up right? How about another idea: You also have a blog post proposing a new way to handle your SEM calls to action from January. What if, instead of the white papers, you offered a free assessment to determine if the reader’s PPC spending is performing as it should? Rather than “download now” the CTA becomes “Assess the effectiveness of your SEM CTAs.” When I click on THAT link I am guided through a dynamic set of questions designed to gauge how effective my SEM strategy is and return a result, which could include 3 things to do tomorrow to improve my SEM performance. That is something I would click on because I can engage with you, and learn something new about myself. You get to tell me something of value, and provide me with a tailored experience. AND the data you collect in the experience creates a much better sales-oriented conversation. Imagine what you could do with that data! That is what we are talking about. Lead-gated white papers are perfectly fine (trust me, we have plenty of them too), but there are better ways to engage with our prospects. If we rely only on pumping out more content in the form of a white paper (or ebook, etc.) then we are missing a huge opportunity to move from talking TO our prospects to actually having a conversation WITH our prospects. Sorry for the length of the comment, it’s something I believe pretty strong about, not surprisingly! Thanks again for your comments, glad you liked the article. I think we’re probably in agreement more than it would seem; it may just be that our approaches are slightly different. I have no objection to learning more about a prospect, or to offering things like assessments. But I wouldn’t do either as a first step. We utilize progressive profiling (as I’m sure you do, as a Marketo customer) to learn more about a prospect as he/she continues to engage. And we’d offer an assessment only upon seeing that further engagement and identifying the prospect as someone with a high degree of interest. Otherwise, we’d be scaring off the vast majority of prospects who (at that moment, anyway) may be simply looking for best practices. My point is that no matter what the options – white papers (and their ebook cousins) continue to be a highly effective, early stage offer. I have a personal mental block around progressive profiling because it is passive. It requires the prospect to keep coming back to you and providing more information over time. Which is great, but the operational reality is that too often we wind up with LOTS of prospects where we know only one or two of the key data points, not all of them. I am sure others have had more successful experiences.